We also provide the option of not only locating the infiltration problems but also offer various technologies to seal off the infiltration. With the use of closed cell grout we force the grout behind the manholes at 1500-2000 psi and it expands behind the wall and fills the void and seals off the infiltration. We also are able to seal off moving streams of water with a fast 20 second sealing grout. 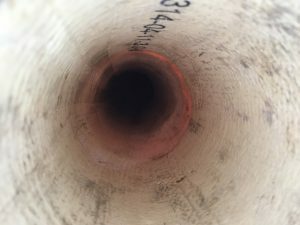 With short linings installed with flow through packer carriers quite often we can repair sections of damaged pipe without shutting down service or requiring a pump around setup.